The functionality that makes the gearless vehicles transmission possible is known as CVT(Continuously Variable Transmission.). This functionality does the work for keeping the engine running while the bike is not in motion. As explained earlier, it has some benefits at the cost of the fuel economy. When it comes to the gearless bikes, the functionality is done such as the bike runs on constant RPM. And there is no manual control over the RPM. Here the Continuously Variable Transmission makes use of the automatic adjustment of speed with pulley. It makes hassle-free driving with gear-less but at the expense of fuel. The more it stops without keeping engine running the more fuel it will consume to fire up and keeping the RPM steady. This results in the limit of how much mileage a bike can give with this lack of control. Also it can affect how much pickup it can take compared to the geared vehicles. In case of geared vehicles, the clutch is used to disconnect the engine from wheels. Here RPM is controlled with the gears. The fuel consumption is reduced due to manual control over the RPM. And here the pickup is improved. Also the bike when needs to stop, requires the use of clutch or the break. If used, it can stop the bike and fuel consumption to fireup the bike, is relatively less. This shows up in the mileage and overall fuel consumption of the geared bike. There is a power loss during the state that requires up for the CVT and clutch but compared to gearless bikes, less fuel is consumed. This is where the role of clutch is important for geared vehicles. The variator system usually works for doing the work of clutch for adjusting the RPM apart from the CVT system. CVT is an “infinite speed” transmission which can change steplessly through an infinite number of effective gear ratios between maximum and minimum values. Unlike traditional automatic transmissions, continuously variable transmissions don’t have a gearbox with a set number of gears, which means they don’t have interlocking toothed wheels. The word gear in CVT refers to a ratio of engine shaft speed to driveshaft speed. Moreover, CVTs change this ratio without using a set of planetary gears. 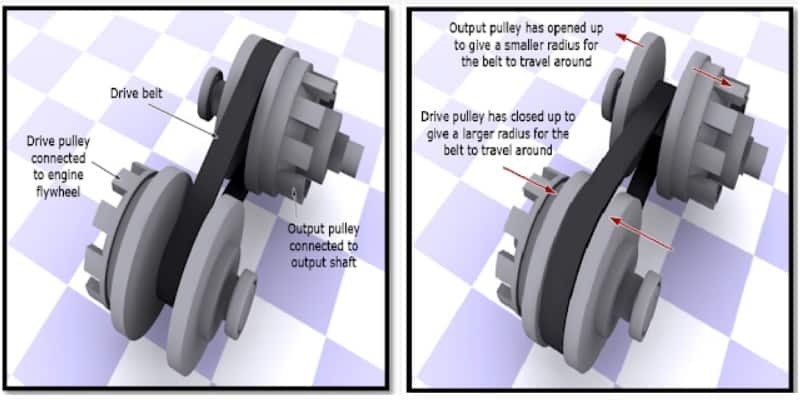 The most common CVT design uses a segmented metal V-belt running between two pulleys. Each pulley consists of a pair of cones that can be moved close together or further apart to adjust the diameter at which the belt operates. The pulley ratios are electronically controlled to select the best overall drive ratio based on throttle position, vehicle speed and engine speed.